Being on the go or working out of the office has never been easier in today’s tech world. Smart phone and iPads are being used for much more than games and social media. Business and writing applications are making it easier to work from any device. When you have to do more than just a little typing, portable keyboards for your device can make the job much easier and faster. It certainly helps to know you can simply take out your device and keyboard, sync without any problems or delay, and get right to work. With so many different companies designing keyboards and with a variety of features to choose from, it can be hard to decide which one will work best for you. We have put together a buying guide with features to consider before purchasing your new iPad keyboard. We’ve also reviewed 10 of the best iPad keyboards available. 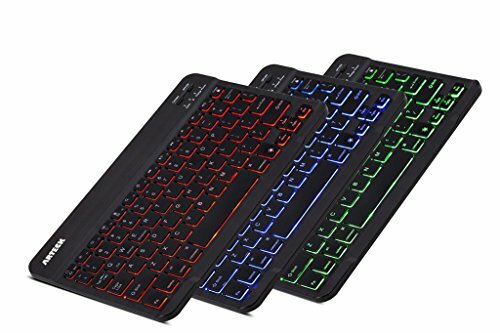 The reviews include cross-compatible keyboards for all operating systems, keyboards specifically designed for iPads, and keyboards designed for specific iPad generations. We hope this will assist you in your search for a keyboard that will suit all of your needs. Compatibility – Some iPad keyboards will work with other devices, while other iPad keyboards are designed specifically for certain generation iPads. Bluetooth Distance – The majority of the iPad keyboards offer a range up to 33 feet. Be sure to check this feature before purchase. Warranty – Using keyboards on the go increases the chance of mishaps. 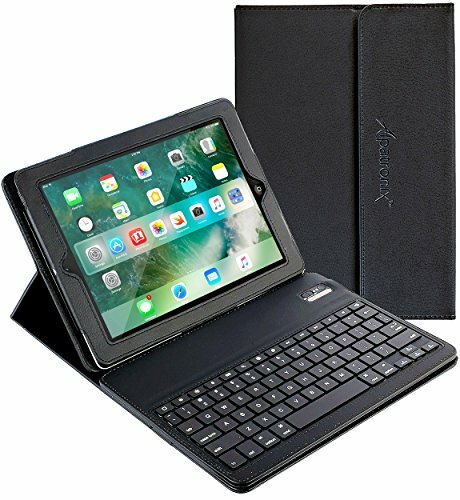 While iPad keyboards are not very expensive, it’s still good to know you can have it replaced without spending more money. Size – The idea of an iPad keyboard is portability, but some users would rather have a full-size wireless keyboard. Many choices are available from full-size to foldable pocket size keyboards. Specialty Keys – If media and hot keys are an important factor in your decision, be certain to research all that is available on a keyboard before purchase. Some offer iPad specific hot keys, and others offer specialty keys for all 4 major operating systems. 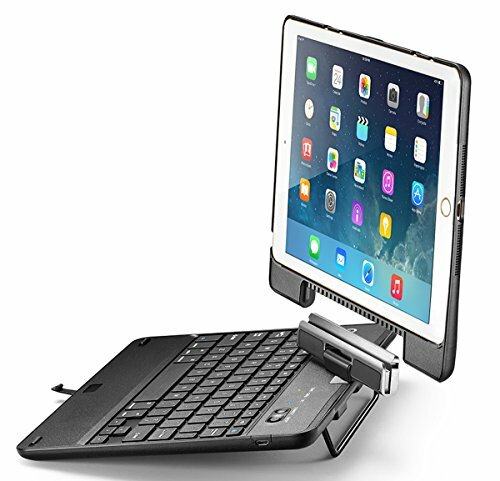 Case/Stand Combo – A great feature of several of these listed iPad keyboards are that they come with a case that offers protection and can also be used as a stand when in use. Battery Life/Charging Time – It’s always a great idea to check the approximate battery life between charges and how long it will take the device to charge. 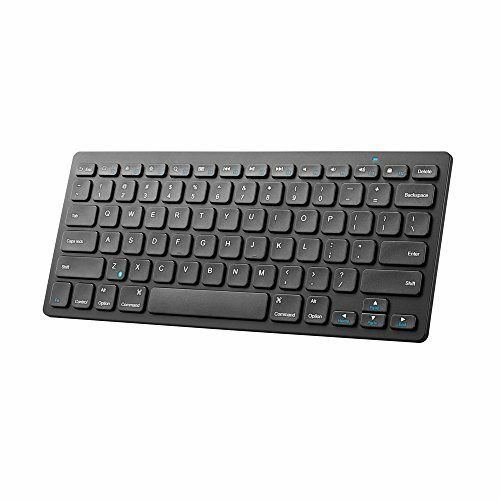 Anker offers this stylish keyboard that is specifically designed to work for iPad Air 2, iPad Air, iPad Pro, iPad Mini 4/3/2/1, and iPad 4/3/2. While created for use with iPad, it is cross-compatible with all 4 major operating systems including iOS, Mac, Windows, and Android. It also includes shortcut keys for all 4 systems. Light and compact, this keyboard has low-profile keys that create a comfortable typing experience and includes media keys. It requires 2AAA batteries and will last 3 months based on 2 hours of use per day with the power saving mode which will automatically shut the keyboard off after 30 minutes of inactivity. System requirements include all iOS, Android 3.0+, Mac OSX 10 2.8+, and Windows 10/8/7/Vista/XP. Anker offers an 18-month warranty. Arteck’s compact keyboard offers a choice of 7 colors backlighting with 2 brightness levels. It has a broad compatibility and works with all 4 major operating systems supporting Bluetooth. This includes the iPad 1, 2, Air, Air 2, and Mini 4/3/2/1. The auto sleep feature enables a 6-month battery life based on 2 hours of use per day with no backlighting. It includes a rechargeable lithium battery, a USB charging cable, and a generous 24-month warranty. 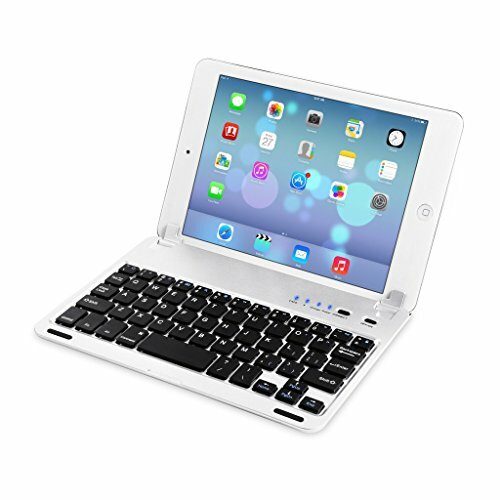 OMOTON offers an iPad-specific keyboard with a QWERTY layout featuring customized hot keys for all iPads and iPhones. It includes 78 keys with 13 iPad hot keys. With Bluetooth 3.0 technology, it has an operating distance up to 33 feet and includes an auto sleep mode. One charge lasts 30 days of continuous use or up to 6 months with intermittent use. JETech offers a keyboard specifically designed for iPad 2, 3, and 4. It is a hard clamshell case/keyboard combo. When used as a stand, it provides 360 degree rotation for optimal viewing. The keyboard layout features classic Apple functions and iOS commands. Once paired with your device, it will automatically connect. With auto sleep/wake mode, it will shut off after 10 minutes of inactivity. The rechargeable lithium battery provides 60 hours of use per charge. Purchasers receive the keyboard/case combo, manual, USB charging cable, and a 6-month warranty. 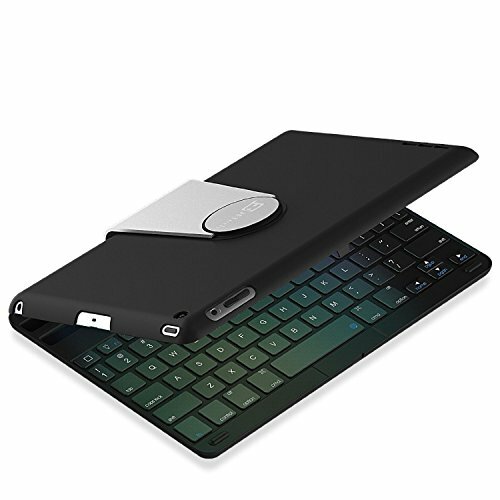 This keyboard for iPad 4/3/2/1, comes with a removable leather case that also works as a stand. The ergonomic design features ABS chicklet keys for comfortable typing and media controls. The Broadcom Bluetooth chip offers a fast and easy 1-time pairing with your device and will allow a distance up to 30 feet. Charging time is 2 hours, and it will allow 120 hours working time or 800 hours on standby. It also features auto shut off and a cut out in the case for camera use. Available in matte black or hot pink, it includes a manual, micro USB charging cable, a 1-year limited warranty, and a 30-day money back guarantee. 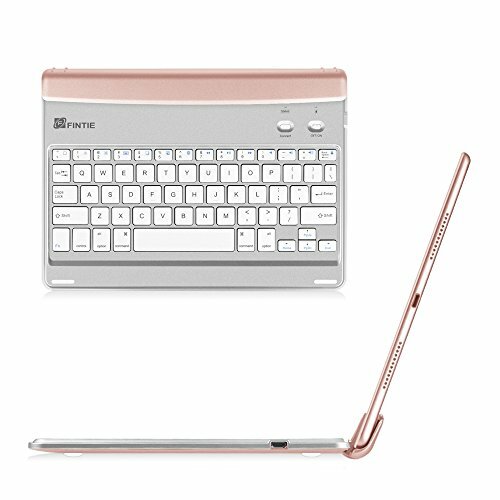 This Bluetooth keyboard designed specifically for iPad Air 2 or iPad Pro 97, is available in gold, silver, rose gold, and space gray. Lightweight and stylish, it is made of ABS materials assuring durability. It has a Bluetooth distance up to 33 feet and the auto wake/sleep feature. The spring keys offer tactile response guaranteeing every keystroke is registered. Media and iPad hot keys are also featured. The New Trent Airbender keyboard and case combo is designed for use with the iPad Air and Air 2. The hard clamshell case has a matte finish, and when used as a stand, it has a 360 degree tilt and viewing angle. An excellent choice for iPad Air users, it has many features. These include a case latch, camera cut-out, security tab, smart cover locking mechanism, and a spacious key layout. It allows a range up to 30 feet. 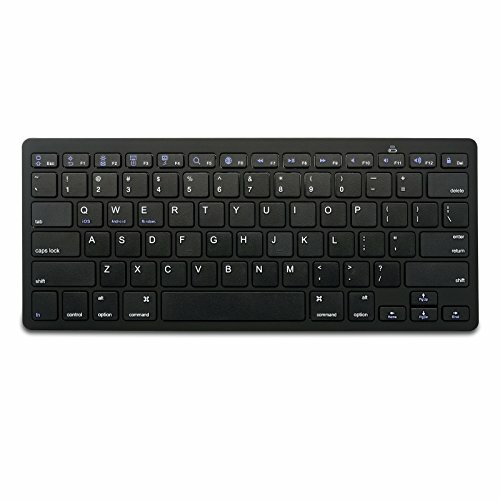 iXCC offers an affordable compact keyboard that works with all 4 major operating systems. It has a 3-month battery life based on 2 hours of use per day. 78 keys include shortcut keys for all 4 operating systems and media keys. It requires 2 AAA batteries and includes a 2-year replacement warranty. 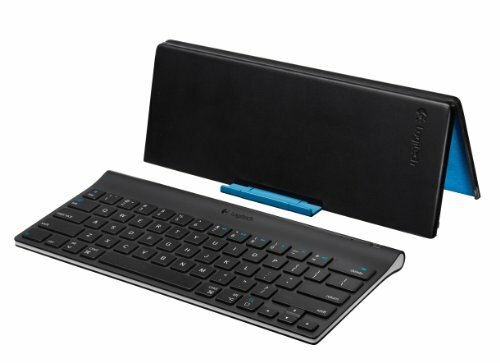 This Logitech iPad keyboard comes with an adjustable stand/carrying case. Designed for the iPad 2, 3, 4, and Mini, it features media keys and allows a 30 foot Bluetooth range. 4AAA batteries are included, and Logitech promises fast and easy pairing with your device. The second Arteck keyboard we reviewed is designed specifically for iPad Mini 3/2/1. It is a case/stand combo allowing a 130 degree swivel. 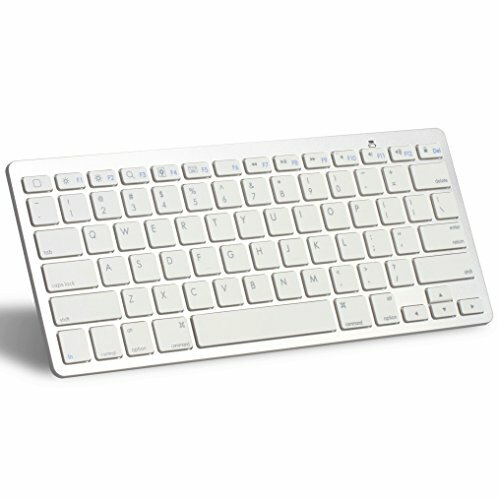 It features a Mac keyboard layout with larger size keys creating a comfortable typing experience for Mac enthusiasts. Charging time is 1 hour and will last up to 50 hours in between charges. It also features the auto sleep/wake function. This Arteck keyboard includes a USB charging cable and a 24-month warranty. We hope you have found our iPad buying guide helpful in your search. We recommend deciding the features that are most important to you. Then, read as much as you can about the product before purchase. We wish you the best of luck in finding the perfect keyboard for your iPad.